As a system admin, We may get a chance to add a vm disk or detect newly added disk physically for to provide more space. 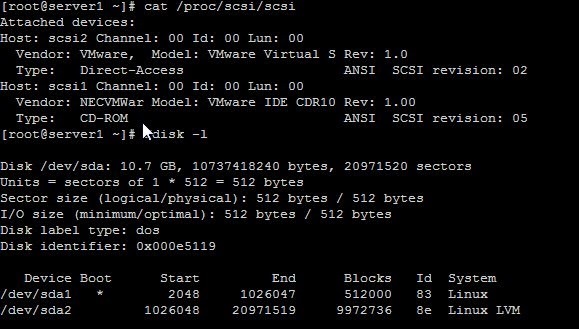 It is possible to add or remove a SCSI device explicitly, or to re-scan an entire SCSI bus without rebooting a running Linux VM guest. 1. Ensure the required size is added newly online without shutting down or powered off in Hypervisors such as vmware esx, vmware workstation and Microsoft Hyper-V before carrying out the Virtual Disk increasing activity. 2. Login into the server with user root or any other user with root privilege. 3. Run the below command to list the detected disk as below screenshot shows.. The above screenshot shows as our linux machine has only single disk of 10GB (/dev/sda). 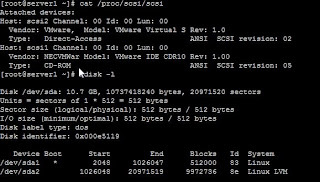 Above command listed the output of number of SCSI device buses, we have to run each below command for each SCSI device buses. Thats it, now you can find new disk using the fdisk command. Hope let this helps someone, please share.